Lanna Mantra Realist by Ping River, 30 rooms in four buildings opened last September. Located on Paton Road, Muang district, Chiang Mai. Room rates are from Bt 2,500 to Bt 4,800 per night including breakfast for two persons. Travel agent earns 30% commission. Yaangcome Village, hip resort with 42 rooms opened 28 October. It is located near the Night Bazaar at Sridonchai Road , Changklan Tambon, Muang district, Chiang Mai. Room rate starts at Bt 4,200 per night. Agents get a 20% commission. from Bt 1,500 to Bt3,500 per night. TAT reported that new hotels due to open before 2008 include the 84-room Chedi Chiang Mai managed by Amanpuri Group and located next to Ping River, 120-room Conrad Chiang Mai managed by Hilton International located at Mae Tang district, 200-room Shangri-La Hotels. 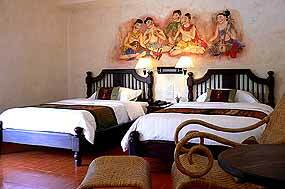 Two other hotel companies plan to build hotels in 2008 — Montien Chiang Mai Hotel and Banyan Tree Chiang Mai. The 25th ASEAN Tourism Forum (ATF), as the region’s major travel and tourism event will be hosted in the Philippines on 13-21 January 2006. Buyers and sellers from all over the world will meet in Davao, a haven for beach enthusiasts, divers and nature lovers alike. Davao is the gateway to Mindanao in the southern part of the Philippines, a world of 7,107 islands. The first Miss ASEAN election took place in March 2005 in Jakarta and the elected Miss will represent the ASEAN countries on the Philippines in January 2006. According to Miss Wendy Chan from TTG Asia Media in Singapore and Marketing Executive ATF 2006 TRAVEX Secretariat, 458 exhibitors from 10 countries, and 470 buyers and media from six continents are participating in this huge international event. This is already putting Davao City on the world tourism map and drawing global attention to its economic upswing. Hotels and resorts in Davao City are briskly upgrading their facilities to prepare for the massive influx of ATF participants. Several meetings will take place at the forum. These include the Task Force on ASEAN Joint Tourism Marketing that will meet at ATF 2006 on 13 January 2006 to discuss areas of cooperation and promoting the region’s tourism attractions, facilities and services, including tourism investment. Officials of the ASEAN Communications Team for Tourism (ACTT) will also meet on 13 January 2006 to discuss their plans and programs to further improve the communications for the ASEAN tourism industry. The ASEAN Ministers of Tourism are scheduled to hold a formal meeting on 16 January 2006. The attendance of the ASEAN Ministers is an affirmation of each ASEAN member country’s commitment to continued regional cooperation in the tourism sphere. Officials of ASEAN National Tourism Organizations, led by their respective Executive Heads, will hold their meetings on 14 and 15 January 2006. Others include the four ASEAN travel trade associations, namely the ASEAN Tourism Association (ASEANTA), Federation of ASEAN Travel Associations (FATA), the ASEAN Airlines Association (AAA) and the ASEAN Hotel and Restaurant Association (AHRA) who will hold separate meetings on 16 January 2006, to discuss their respective plans and programs to further improve the quality and standard of the ASEAN tourism industry. The ASEAN Tourism Conference (ATC) on 18 January 2006 is open to all registered delegates. The ATF 2006 theme, “Celebrating The Many Faces Of ASEAN” will be discussed by panelists and leading travel experts invited to the event. Junnapong Sarannak, Director of Tourism Authority of Thailand (T.A.T. ), Northern Office Region 1, revealed that tourist numbers visiting Chiang Mai in 2005 rose to 3.8 million, an increase of 2 percent but although they spent 40 billion baht, this was a decrease of 10 percent in real terms due to the increased cost of living stemming mainly from increased fuel prices. It is expected that in 2006, the International Horticultural Exposition and the opening of the Chiang Mai Night Safari, will see 4 million tourists bringing in a hoped for 50 billion baht. Analysis of the tourist numbers showed that the majority were Americans with lesser numbers from England, France, Germany, China and Japan. It is hoped that when airlines fly directly into Chiang Mai there will be more tourists from SE Asia, whom, although usually staying for a shorter time than Westerners, spend more money playing golf, enjoying spas and shopping. Recent studies have shown that visitors to Mae Hong Son were only attracted to the area during the Mexican Sunflower season. Direk Konkleep, Governor of Mae Hong Son is determined to change this. He has sent Provincial Officers to seek out new tourist attractions, and these will be heavily advertised and promoted. The emphasis will be placed on areas of natural beauty and the lifestyle of the nearby Hilltribes, which, if done tastefully and sympathetically, would encourage tourists to visit these areas, without intruding on the day to day life of the people concerned, though it hard to imagine just how this would be done. Prayoon Thongsirikul, head of Tham Kaew Komon National Park, in Mae La Noi, Mae Hong Son revealed that many tourists had already booked to visit Kaew Komon Cave, (or the Ice Cave). The Park is to extend the visiting times to 7 a.m. - 8 p.m., and increase the staff from six at present, to 12. Admission to the cave will be free and entry will be supervised and controlled by the staff to ensure the safety of visitors at all times. There are five floors in the cave, each named by Queen Sirikit, who visited the cave in 2001. The names are, 1st floor, Phra Thai Tharn; 2nd floor, Wiman Mek; 3rd floor Chek Himmaphan;. 4th floor Man Pha Kaew and the 5th floor, Phred Preaw Manee Buppha, or Ice Cave. Nok Air is to begin flying the Chiang Mai-Mae Hong Son route, which was transferred from Thai Airways, with one flight per day beginning from January 16.
that this will offer a new choice for residents and tourists. BP Air is also flying a direct route from Bangkok to Mae Hong Son every Monday, Wednesday and Friday, which helps support Mae Hong Son tourism and the local economy.